Changing what displays in the Recent Activity tab on the Geni home page is very easy. First of all, click on the Filter drop-down menu under the Recent Activity tab. 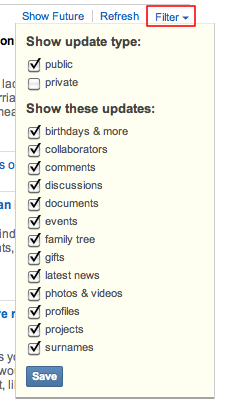 Next, decide what you want to be displayed by unchecking topics that don’t interest you. For example, you might only want to see public messages. In that case, you’ll just uncheck the Private box. Click the Save button, and let the page refresh. Now you’ll only see what you want to see. It’s as easy as that.